First of all, having SAP provide these Developer Edition ABAP servers for FREE is an absolute blessing! I’m sure the entire community is absolutely grateful and appreciate it – I know I am! Anyway, I did notice a couple of issues when I first installed these instances with DBACOCKPIT and would like to share some of the fixes that I’ve done to my local instance. I’ve had these fixes ‘documented’ for a while but didn’t have the time to publish them. But, here they are and I hope these will be useful to others too. The steps below should be applicable to both the 750 SP02 and 751 SP02 versions. DISCLAIMER: I am not a SAP Basis resource nor a SAP DBA, these steps below somehow worked for me and I certainly cannot guarantee that they will work for you too. Proceed at your own risk (especially the part about extending the DB)! I can not be held responsible if any of these steps below made your system unusable. If you agree, you may proceed. ISSUE: If you run transaction DBACOCKPIT after installing the server, you might notice the error messages below. I believe that’s because the password for the user ‘sapsa’ was changed to the master password that we entered during installation and needs to be updated in the system. 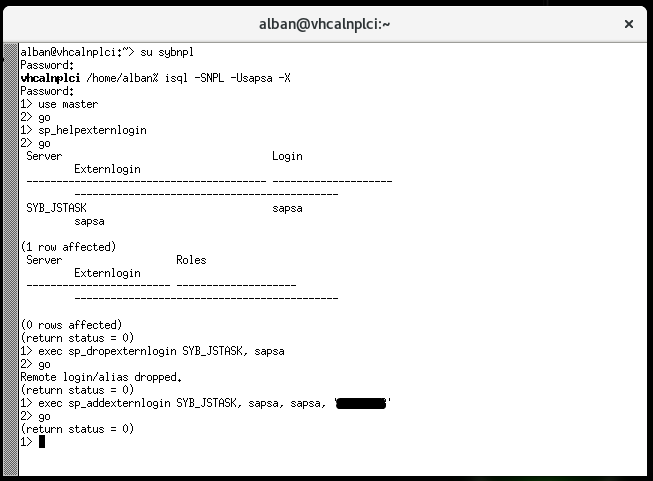 Step 2: Navigate to System Landscape -> Database Connections -> Then drop-down on the folder SAP ASE and select the node +++SYBADM. If you click on the “Test” button before changing your username and password, you might see this error message below. That’s it! Now, if you restart the DBACOCKPIT transaction again, you no longer get the error messages that you saw earlier. ISSUE: Data Collector and other periodic jobs are getting some sort of authentication errors as well. Look at the ‘Errors’ column and select on one of the rows with Errors on it. SOLUTION: After some Googling around, looks like we just need to drop and recreate the extern login for SYB_JSTASK. For this, go to the virtual machine and run XTERM and execute the following commands. You should see a return of at least 1 row with the Server SYB_JSTASK and Login/Externlogin with sapsa. Now, let’s fix the issue by dropping the Externlogin and re-creating it again. We execute sp_dropexternlogin to drop it. And that’s it. If you have followed the steps above, you should get a similar screen as below. And now, if you go back into DBACOCKPIT and monitor the logs of the periodic jobs again, you should now see success entries instead of the error logs. Refer to the green arrows below. 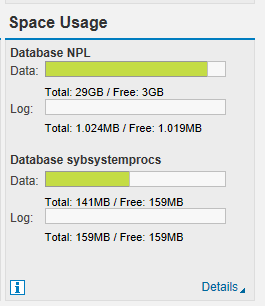 While browsing around DBACOCKPIT, I also noticed that the free space for database NPL is pretty limited. 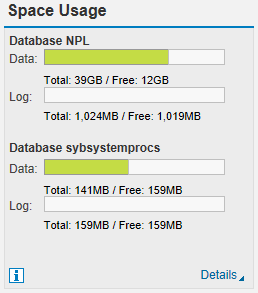 There’s about 3GB of free space left for the delivered AS ABAP 751 SP02 instance. You can find the screen-shot above in DBACOCKPIT if you click to ‘Database NPL’ tab, then Performance -> Dashboard and look under Space Usage. This step is completely optional. 3GB should really be sufficient for a lot of the POCs or test development that I want to perform but I wanted to see if I could extend / add more space to this database. If you do too, you can follow the steps below, but please make sure that your virtual machine has enough free space to be allocated to the database. I am going to extend the database by another 10GB of space. Done! Now, let’s head back into DBACOCKPIT and see what we’ve done there. That’s all folks! Good luck! I’d like to do the two configuration changes for the database when setting up the DEMO server. 1. Enlarge the memory of ASE database. -> This is a static parameter so you have to reboot ASE DB to take effect. 2. Enlarge the number of user connections of ASE DB. After I installed the DEMO system I also notice that the default value of the “number of user connections” parameter is set too small (only 25) for AS ABAP application server. If I increase the number of work processes, then I got database related shortdumps to address this as well. This is controlled by ASE parameter “number of user connections”. It is a dynamic parameter, just set to 500 then usually you don’t need to worry about it. -> This change takes effect immediately. (As long as the configured max memory is sufficient for ASE DB). Thanks for the tips Alex! It’s certainly very helpful as well!